The wide bodied Jaguar Mk7 to Mk9 saloons featured many of the luxury leather and walnut timber fittings typical of the Rolls Royce limousines available at the time, making the Jaguars a popular and considerably less expensive option in the luxury car market. The beautiful Jaguar Mk9 was has been refurbished in 2015. The unique curved appearance of the Jaguar Mk9 saloons set a new style standard that was continued in the popular Jaguar Mk2 models through to the late 1960s. 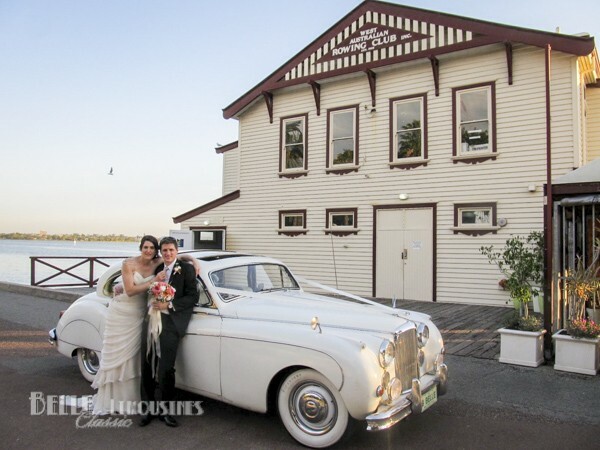 The Jaguar Mk9 is a stylish and popular wedding car which is perfectly matched to Chrysler limousines. 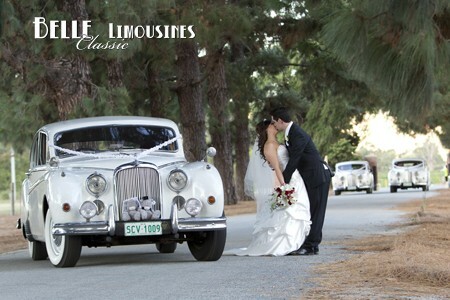 Belle Classic Limousines’ Jaguar Mk9 sedan has recently been repainted and reupholstered to our wedding specifications. The Jaguar Mk9 is fitted with a reliable modern motor and icy-cold air-conditioning for your comfort. 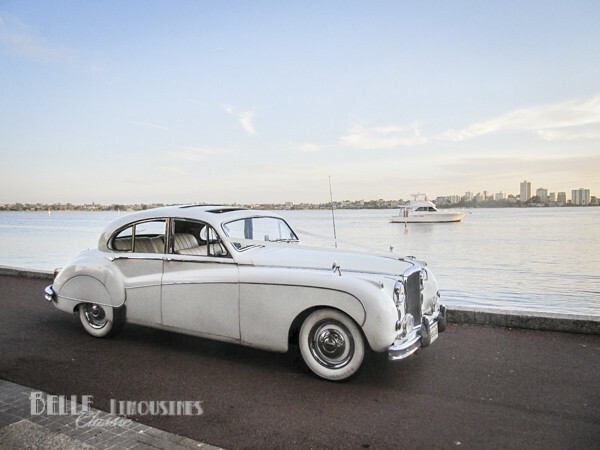 The Jaguar Mk9 saloon is one of our stand alone bridal cars available to give couples a choice of feature wedding car. The Jaguar Mk9 is a spacious wide bodied car with a deceptive small car look from a distance. The newly reupholstered interior is light and clean with beautiful wood accents. The wide bodied Jaguar Mk9 saloon is a very comfortable four passenger car. 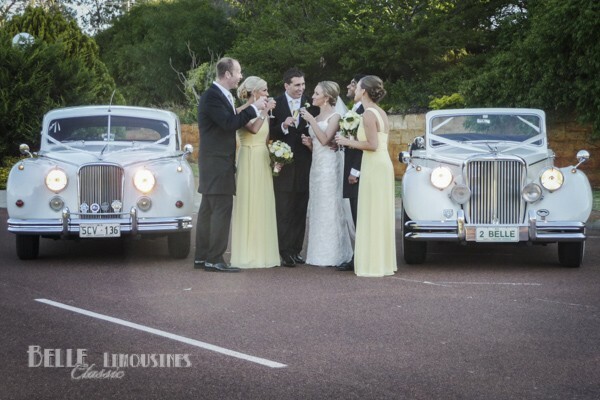 We do recommend three passengers if the bride is in the car, however, four passengers can also be very comfortable. This is based on a mix of average passengers. If your party contains very tall or stout members you may need to adjust the passenger count – you know your group bet. Jaguar built the Mk7, Mk8 and Mk9 sedans from 1951 through to 1960. There are minimal cosmetic changes between the models. the Mk7 models have a split windscreen, trafficators that pop out to indicate turning and full wheel spats and a Jaguar face as a bonnet mascot instead of the famous pouncing Jaguar. the Mk8 model has a one piece windscreen, conventional indicators in upgraded rear lights and introduced the scalloped wheel spats. the Mk9 was a significant advance mechanically incorporating four wheel disc brakes, automatic transmissions and power steering. It also has a modified grill reintroducing the pouncing Jaguar mascot as a bonnet ornament, scalloped wheel spats and chrome detailing along the side curves. The Jaguar Mk5 was the development platform for the Jaguar Mk7 model. Apart from the new body style and engine most of the fittings, lights, chassis and suspension are the same. The success of the newly engineered car is best demonstrated by its 10 year production run which is quite an achievement for the period. 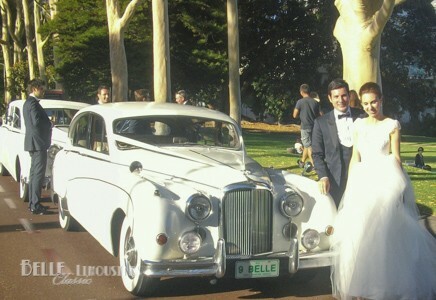 The Jaguar Mk9 wedding car was chosen by Belle Classic Limousines as a feature bridal car to accompany the Chrysler 300C limousines. 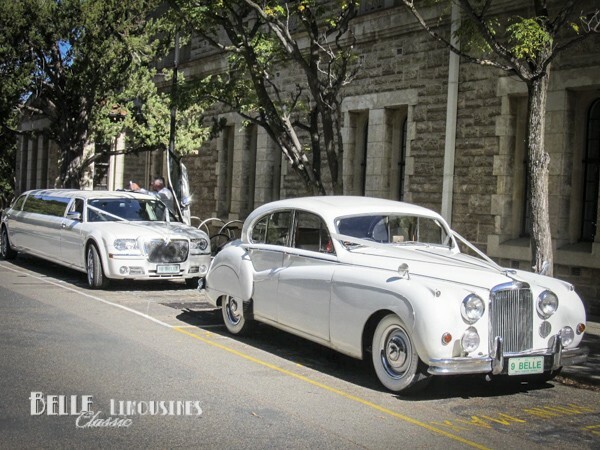 The Jaguar Mk9 is also a good complement to a Rolls Royce Silver Cloud bridal car. Usually the larger Rolls Royce is chosen as the feature bridal car with the Jaguar supporting with a small wedding party. 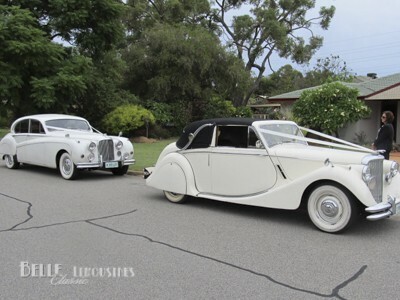 The Jaguar Mk9 saloon also works well as a feature bridal car followed by a pair of Jaguar Mk5 sedans for a bridal party of up to eight or following a Jaguar Mk5 convertible as wedding party transport for four. 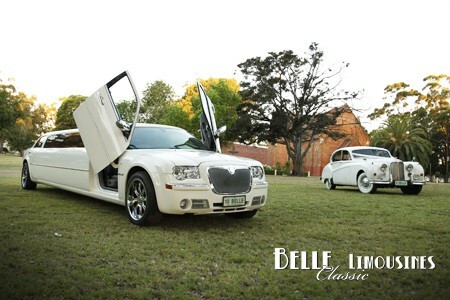 Belle Classic Limousines will also work in conjunction with other businesses if necessary but we prefer to supply all wedding party transport when ever possible. It is not possible to guarantee a consistent level of service with mixed businesses as is conveyed in this feedback. 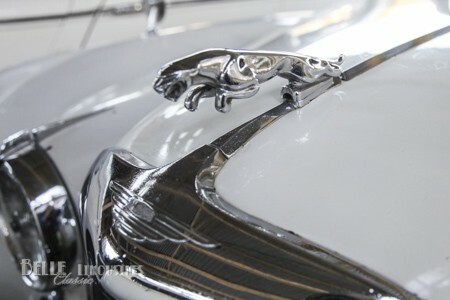 Curves became the signature style of Jaguar during the 1950’s Jaguar coach builders. Coach builder is the car industry term for a body builder – the sheet metal kind, not the muscle man with weights. Coach building as the name suggests is related to the tradesmen who built rail coaches and horse drawn carriages through the 1800’s. Jaguar designers created cars without a flat panel to be seen – sleek and flowing aerodynamic cars with a sports feel. They designed cars that were large and low and incorporated the latest in engineering for the time with engines that were winning on the race tracks of the world. Jaguar redesigned the famous leaping Jaguar mascot for inclusion on the Mk9 bonnet after it was omitted from Jaguar Mk7 and Mk8 saloons. The one piece dual ribbed bumpers were a huge improvement on the Jaguar Mk5s complex bumpers while continuing the unique styling. The fog lamps fitted to the Jaguar Mk7 reverted to a more common form mounted on the bumper bar. The interior of the Jaguar Mk9 saloon has been recently refurbished with ivory upholstery and beige head lining. Jaguar fitted their large saloons with walnut burl cabin trims and dash and leather seats in competition with the luxury Bentley and Rolls Royce limousines being built at the time. Our Jaguar Mk9 has a bench front seat with a wood panelled rear facing the passenger seat. Jaguar Mk9 sedans were fitted with the legendary 3.8 litre double over-head cam engine coupled to a full syncromesh Moss gearbox or the newly introduced automatic transmissions. Our Jaguar has been modified to a reliable Ford 4.2 litre motor and auto transmission. 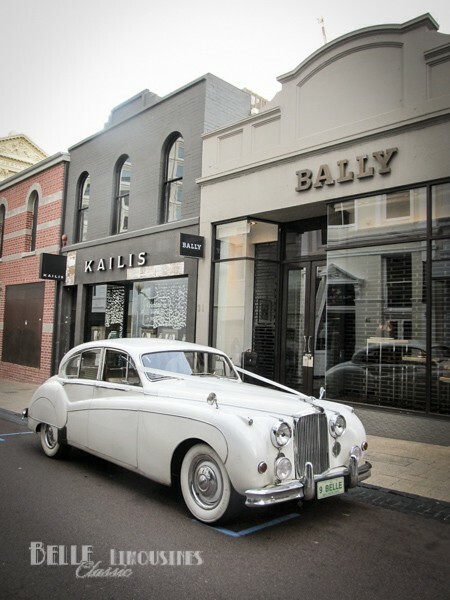 The reliability of the Australian production engine means that your wedding car is easily serviced and maintained and in the event of a major component failure we can have the vehicle back in service usually within the week.